Lock picking is something I’ve been doing for quite a while and I wanted to share some tips on how to learn to pick locks. We plan on having many more articles covering lock picking, but this is just an introduction. This skill set is invaluable in many situations you might find yourself in. Locking yourself out of the house, loosing the key to that padlock on your gear locker, escaping and evading or getting into someplace covertly. We’re not advocating anything illegal here, as this skill set is perfectly legal to have as a hobby. After learning how to pick locks, you’ll never want to leave the house without a pick and a tension wrench…just in case. However, no matter how much you read on the subject you’ll still need to put a pick and tension wrench in your hands and get a feel for it yourself. There’s nothing to describe the sound of successfully picking a lock! 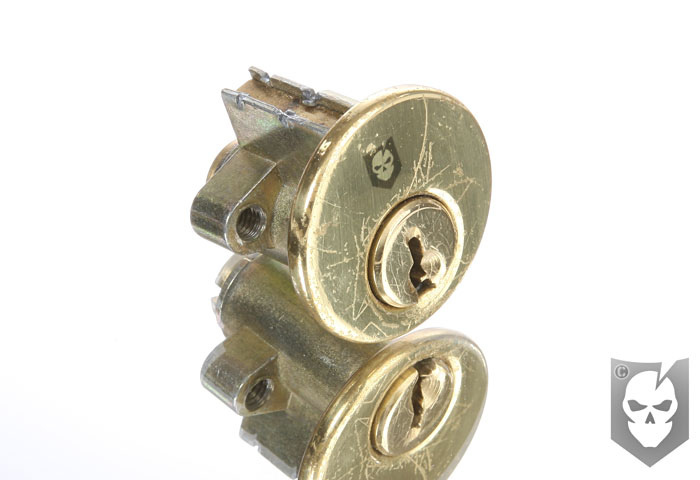 The most common locks are pin/tumbler locks, these locks are found on most doors and are the most common type of lock you’ll encounter. 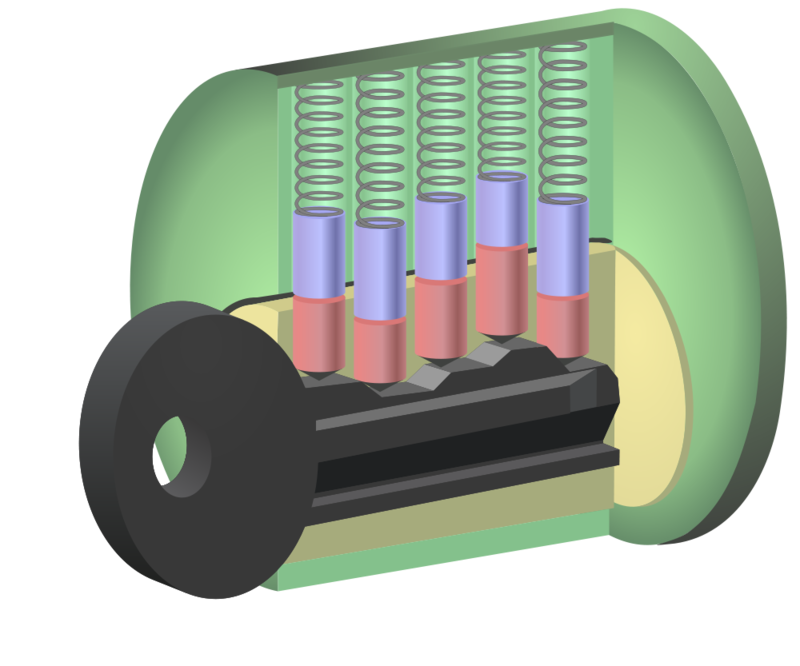 The design consists of a plug (yellow colored area in the diagram below) that rotates around inside of a cylinder (green colored area). The cylinder is affixed to the door remaining stationary. 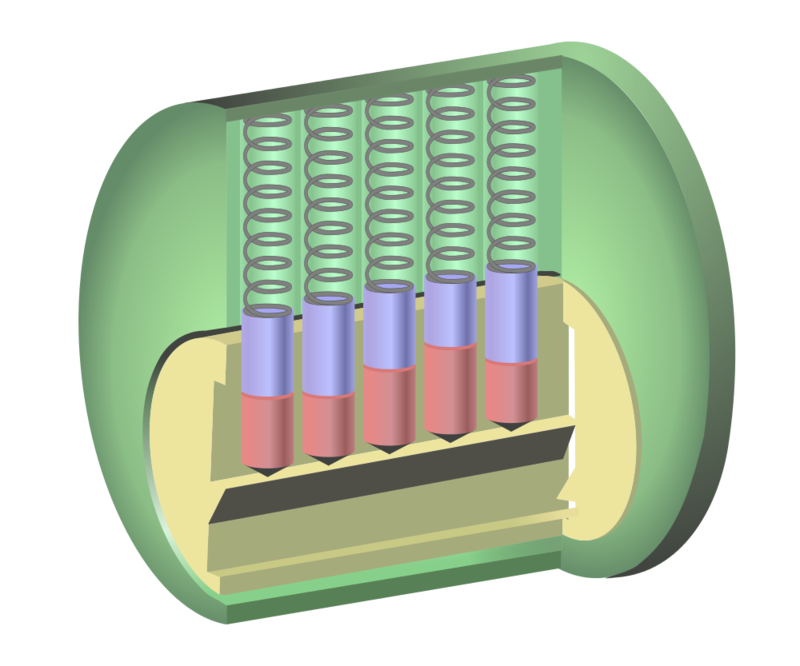 In the diagram you’ll see from top to bottom inside the cylinder, springs, driver pins (blue) and key pins (red). 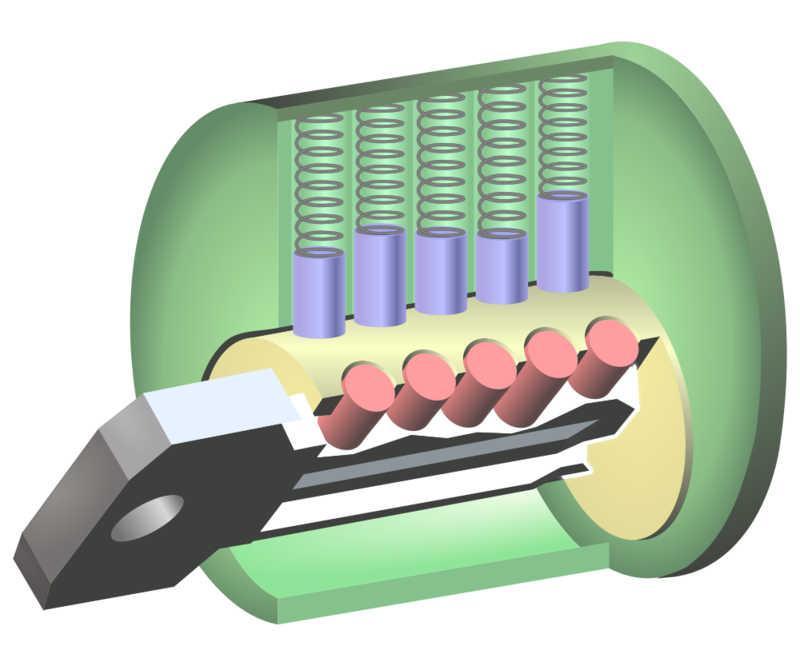 Without a key inserted into the plug, as shown in the above diagram above, the driver pins are pushed downwards due to the spring tension and prevent the plug from turning. 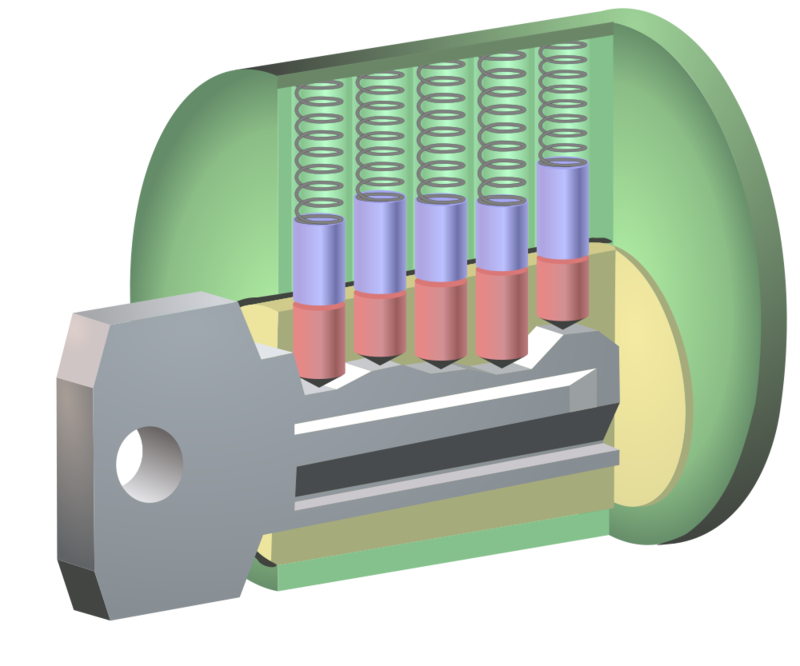 When the proper key is inserted into the plug the driver pins and the key pins align with the shear line, which is the line where the plug meets the cylinder. The key pins are what rest in the differently cut grooves (or bitting) of the key. When a lock is re-keyed by a locksmith he changes the key pin lengths requiring a differently cut key. When the pins align with the shear line it enables the plug to rotate freely and unlock. If an incorrect key is inserted into the plug, the pins will not align with the shear line and prevent the plug from rotating. 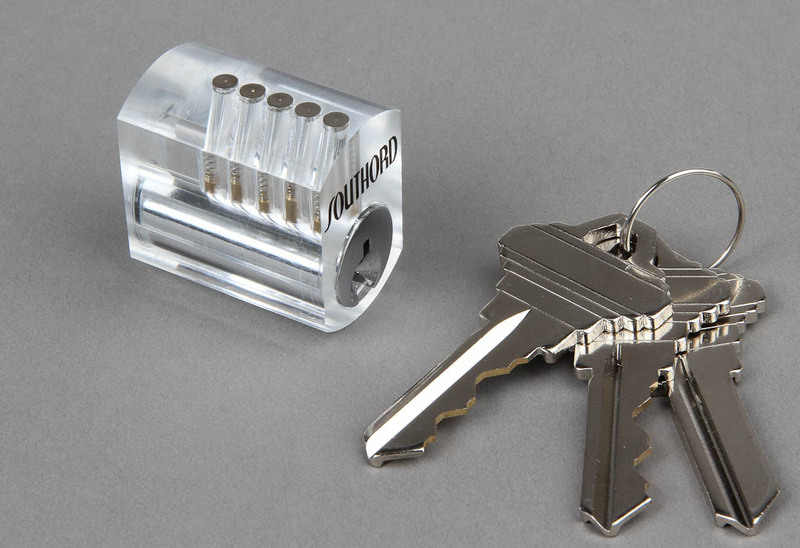 When picking pin tumbler locks the logic is to raise each stack of pins, one by one, until the stack’s position reaches the correct point with the shear line and the plug turns freely. A tension wrench inserted into the plug provides the torque needed to turn the plug a bit more as each pin stack is “picked” into the right position. What will happen when you get your pick in the plug… get your minds out of the gutter! is that there will be one pin stack that is resisting more than the others. This pin stack is the one most preventing the rotation of the plug. Pick this stack first and you’ll get some feedback which will move the plug slightly. Move on to the next pin stack where you feel the resistance, and eventually the plug will spin free. There’s not much to lock picking, but again you really need to get a feel for all of this yourself and perfect your technique. Don’t give up if you don’t succeed at first. I had a hell of a time when I first tried to learn, and swore I was doing things right. It wasn’t until I bought a training lock that it all clicked for me. They’re great because you can visually see the pin stack move relative to the shear line as you pick. There’s something about seeing what you’re doing that makes all the difference. I highly recommend one! On a side note, the training lock that I linked to is in the ITS Store, but my original when I wrote this article was sold by 215Gear, who no longer offers lock picking tools. 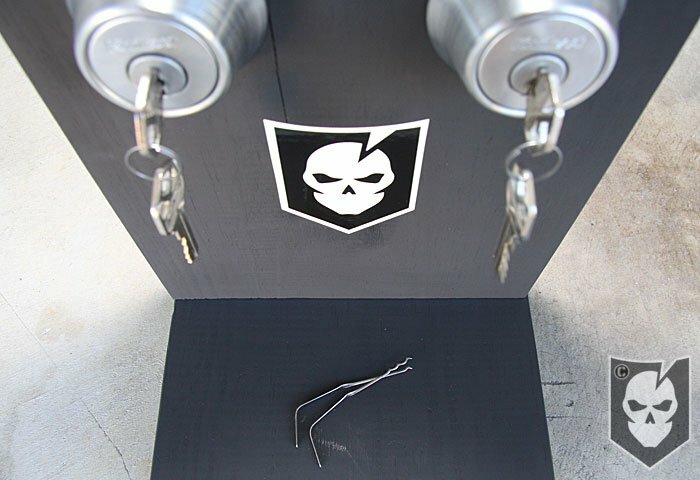 The ITS Store also offers a selection of Lock Picking Tools and Trainers if you’re looking to get into lock sport or want to learn more about the illusion of security. 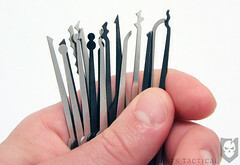 Stay tuned for future Lock Picking articles! 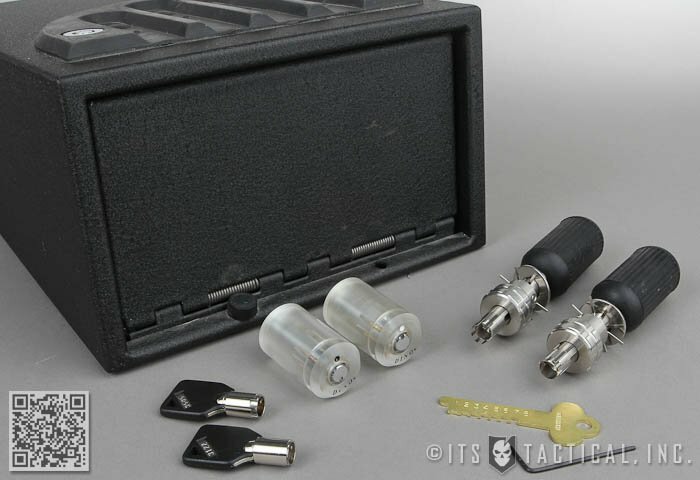 These lock picking tips and techniques provided in this article are only to be used in accordance with all local, state, and federal laws and provided for lock sport (recreational lock picking) use only. Lock sport should be used to learn about the illusion of security, and how to properly protect yourself and your possessions. Don’t do anything illegal.